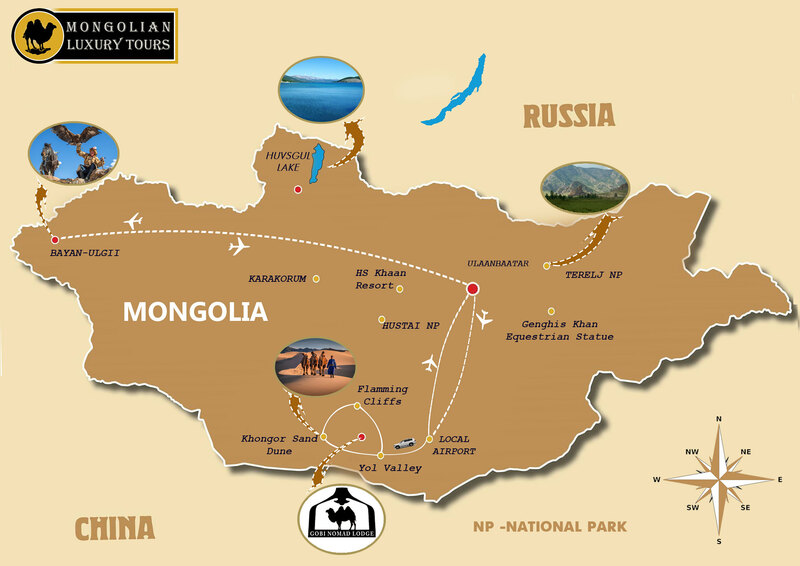 This tour takes you to the naturally and culturally unique attractions of Mongolia: amazing Gobi desert and the land of eagle hunters. The tour opens with vast diverse terrains of the Gobi desert, the northernmost desert in the world, where you will climb the towering mountains of desert sand dunes at Singing dunes and to a short camel trekking along the dunes, do some walking on the top of the famous in the paleontological world Flaming cliffs under which the huge dinosaurs are buried, climb up to the top of the hill to see Bronze Age rock paintings scattered all over the hill trying to understand what messages the ancient people sent to us and enjoy two hour hiking in the unique natural scenery, Yol valley, where the winter ice is kept until the middle of July out of the desert heat. And at end of your Gobi tour you will visit a local nomadic family where you can learn about the way the Mongolian nomads live throughout the centuries, how they manage their unique but hard life and how the modern changes affect their lifestyle. Then our tour goes to Bayan-Ulgii province where Kazakh minority lives for over 100 years and practice thousand years old culture of hunting with a Golden eagle. Kazakh people are famous with their boundless hospitality, they are always delighted to share their carefully preserved their traditions including a private eagle hunting performance /catching fox or hare with a trained eagle/, demonstrating horse riding skills /grabbing a small items from ground while horseback/ and other competitions which are held annually in early October at the Golden eagle festival which we can offer on your request, so you can feel the spirit of Altai mountains and the festivity itself. Between the competitions you will be served with piles of delicious Kazakh food and desserts and a small traditional folklore performance.